MORRISDALE —On Thursday, Jan. 31, two teams, along with their fans, will come together for an epic night of wrestling at the West Branch High School, all while celebrating a proud alum. 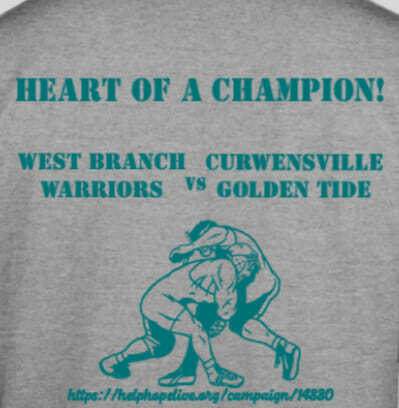 Beginning at 5 p.m., the West Branch and Curwensville wrestling teams will participate in Heart of a Champion Night at the West Branch High School to help John “Sam” Milliron, who is awaiting a life-saving heart transplant. Milliron is a 1968 Curwensville graduate. He received an LVAD heart pump in October of 2018 as a bridge to transplant, but a heart transplant is ultimately the only chance of survival for the father of three and grandfather of seven. A large range of out-of-pocket costs are associated with the transplant, including co-pays and deductibles, doctor visits, temporary lodging and travel and a life-time of highly expensive anti-rejection medications. Milliron is fundraising with the non-profit Help Hope Live at helphopelive.org. His grandson, John, is a senior on the West Branch wrestling team; Heart of a Champion Night will overlap with his West Branch Senior Night to support his grandfather’s heart journey. The public can enjoy Heart of a Champion Night on Jan. 31, beginning with elementary wrestlers at 5 p.m., followed by junior high at 6 p.m. and varsity at 7 p.m.
Also, you can get your Sam Strong/Heart of a Champion T-shirt for a $15 donation by contacting John Milliron at 814-553-0302 before Jan. 22. Proceeds from Heart of a Champion Night and T-shirt sales will be donated to the non-profit in honor of John Sam Milliron. Can’t make it? You can make a donation at any time in honor of John Sam Milliron by calling Help Hope Live at 800-642-8399 or visiting helphopelive.org. Donations are tax-deductible to the extent allowed by law, and all funds raised will be used to offset medical expenses via Help Hope Live’s Mid-Atlantic Transplant Fund. Help Hope Live is a national non-profit that specializes in engaging communities in fundraising campaigns for people who need a transplant or are affected by a catastrophic injury or illness. Since 1983, campaigns organized by Help Hope Live have raised over $135 million to pay patient expenses.